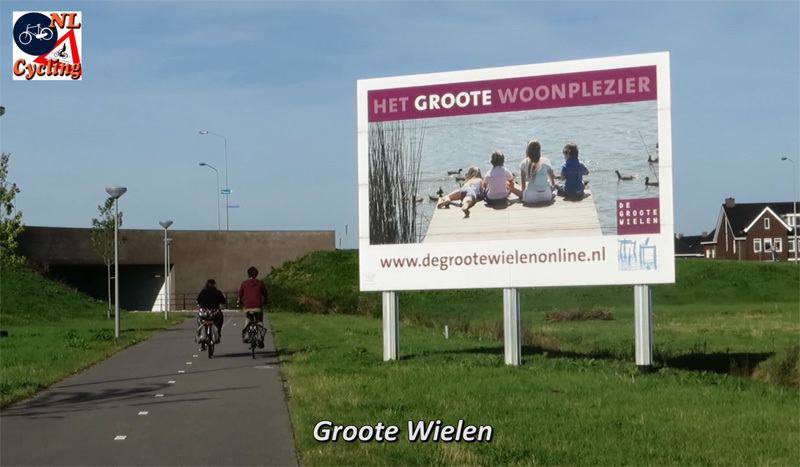 Since 2005 the suburb “Groote Wielen” has been under development in an area just north of the town Rosmalen that belongs to the municipality of ʼs-Hertogenbosch since 1996. The name would translate as Large Kolks, which are the large bodies of water that stay behind after floods. The suburb is advertised as a new town in nature and naturally with a lot of water (even more water than usual in this country). The entire development was designed by landscape architect and artist Hubert de Boer. Groote Wielen will eventually get about 6,500 dwellings. In the first step of the first phase that is under construction now, 3,200 homes will be built south of a large body of water in 4 different neighbourhoods. North of the water there will be two more parts (one of which will be the “centre”), with another 1,100 residences. This is the second step of the first phase. A later expansion is foreseen in the north-east corner with another 2,200 homes, but that phase 2 area has not even been designed yet. The types of dwellings will be 20% social housing, 30% in the middle segment (up to €265,000) and 50% of the homes will be over €265,000. The number of residences per hectare varies (and is of course linked to the price range). 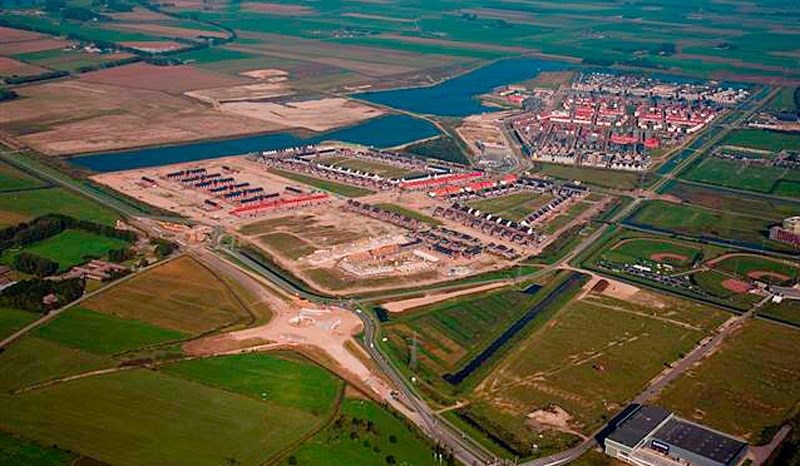 There will be 20 homes per hectare in Watertuinen, but 40 per hectare in Vlietdijk. Most of the homes are terraced houses with a small garden, with a living space varying in size from 110sqm to 450sqm. Vlietdijk also has apartment buildings (hence the higher density). The centre will also get apartment buildings which will be situated over the shops. The entire development will house about 10,000 people after the first phase is completed. When phase 2 is also finished that can increase to about 15,000. The main cycle routes run close to and in front of the homes. This improves social safety. This area has some more expensive semi-detached houses. The street is only used by residents and is a dead-end street. So traffic is very light. In fact it is so light that motor traffic and pedestrians almost share the same space (there is only some colour difference in the paving), even though cycling is done in a separate space. 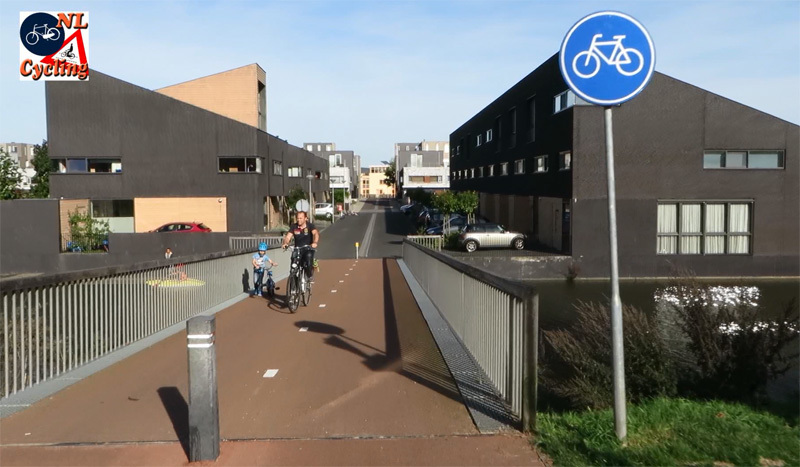 Cycling is also permitted on the street, to reach these homes for instance. Everything will have to be easily accessible. So that means a good road-network had to be designed. But traffic was not to affect the quiet atmosphere and safety in the new residential area. That is why motorised traffic has only limited access. Traffic is led around the different residential parts, so in those areas you only have traffic that really needs to be in that particular neighbourhood. From the through roads there are only one or two access points for every neighbourhood. 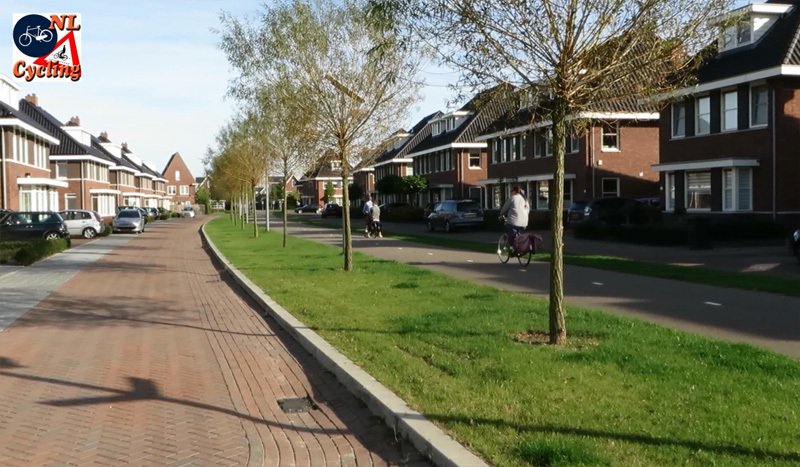 This has become the standard in The Netherlands, that was set in Houten and that you can also see in re-designed older areas such as the example I showed before in Utrecht-Overvecht. 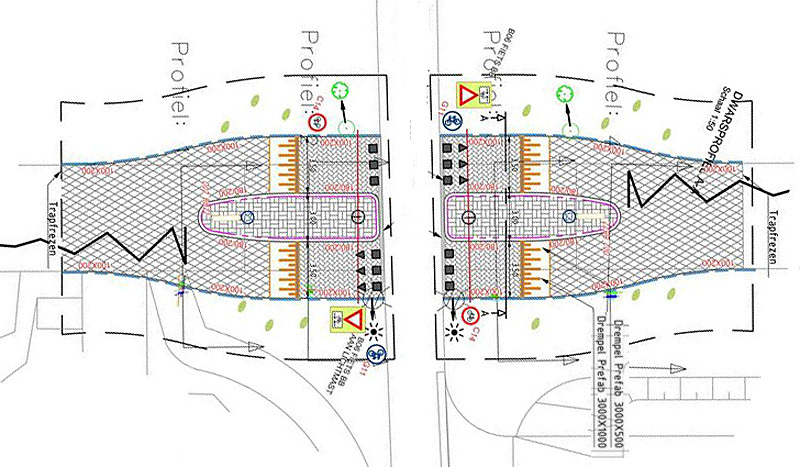 Because of this design none of the junctions in the entire suburb needs to be signalised. The networks for cycling and for motor traffic are quite different. You cycle mostly away from motor traffic. Through traffic is kept as far as possible from the residential areas and these areas only have one access point. For cycling it is the exact opposite. The main cycle routes go right through the neighbourhoods. The north-east corner of the suburb is not yet designed and marked as ‘agricultural land’ on this map from www.degrootewielenonline.nl/). Without through traffic it is possible to give walking and cycling priority in the residential areas. Drivers will have to adapt their behaviour to people. The speed limit is 30km/h (18mph) in all residential streets. Only on a few main routes away from homes that limit is 50km/h (31mph). Motor traffic is not restricted; every home can be easily reached and the motorway is only minutes from every home. But because of how not only the streets, but rather the entire area has been designed, that traffic is not dominating at all. Every dwelling has 2 parking places if they are planned on land owned by the resident. If parking has to take place on the public road the norm is 1.6 car per residence. Parking for visitors is always on the public road and set to 1 parking spot for 3 homes. Parking is done in special parking streets and areas. That means that for instance in the neighbourhood Broekland more than half the public space is not accessible to motor traffic. It is primarily designed as space for humans who walk, cycle, live and play there. It is also where you find green space and water. One of the main routes for motor traffic as seen from a cycle viaduct. The speed limit is 50km/h (31mph) here. Cycling or walking is prohibited on these through routes. Note that there even is water between this route and the homes to the left. In and around Groote Wielen a network of good cycle routes was planned and built. The traffic flows are unravelled. 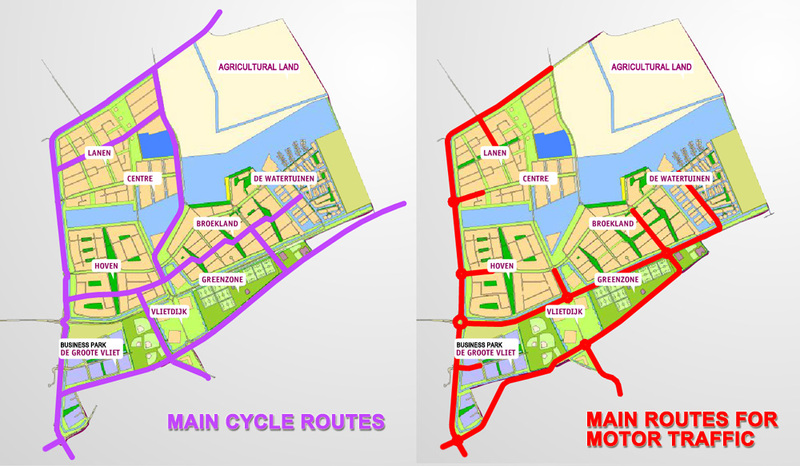 That means that the cycle routes are different from the motor traffic routes. Because the cycleways are away from motor traffic (what the Dutch call ‘solitary’) they can be bi-directional in a safe way. 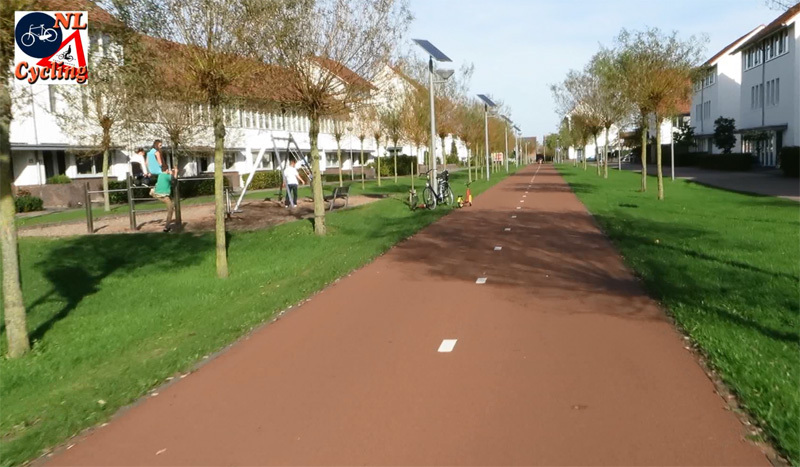 These solitary cycle routes run in front of the homes, to increase the social safety. People look out of their windows onto the cycle route. Crossings of cycle routes with main motor traffic routes are grade-separated. Cars drive a bit below ground-level and you cycle over these roads without having to go up too far. At the entrance to the area (in the south-east corner) we find the big new cycle viaduct that I have shown you earlier. Where the cycle routes cross minor streets for motor traffic in the residential areas, people cycling have priority. 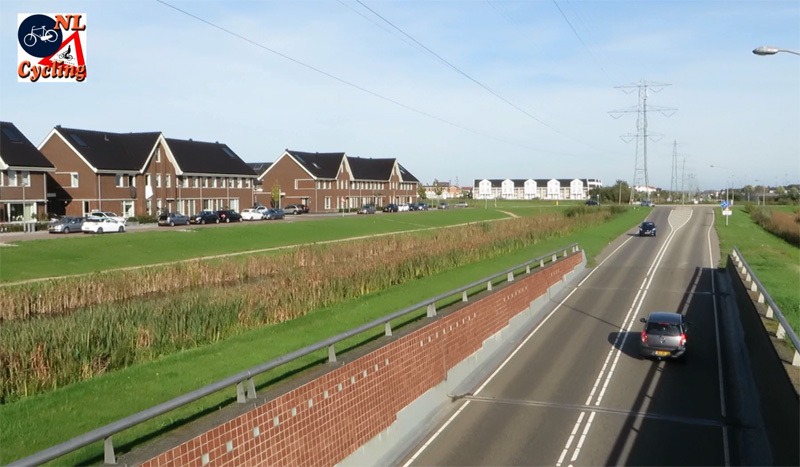 The drawing for the latest reconstruction of the cycle crossing with Vlietdijk. Cycling from top to bottom, motor traffic drives from left to right. The residents were not always happy with these level crossings. There was one of the cycle route with a 30km/h road that became notorious very quickly. Residents claimed motorists drove up to 80km/h and there were crashes with cyclists, of which some were injured (but luckily none killed). Poor sight lines and speeding made the crossing scary, it was said. The city of ʼs-Hertogenbosch has made several changes to the crossing to improve the situation, but speed bumps and signs were unsuccessful. In the final version from July 2014, a centre refuge island was constructed. This gives people cycling a safe haven and makes more clear to motor traffic that there is a special crossing ahead. 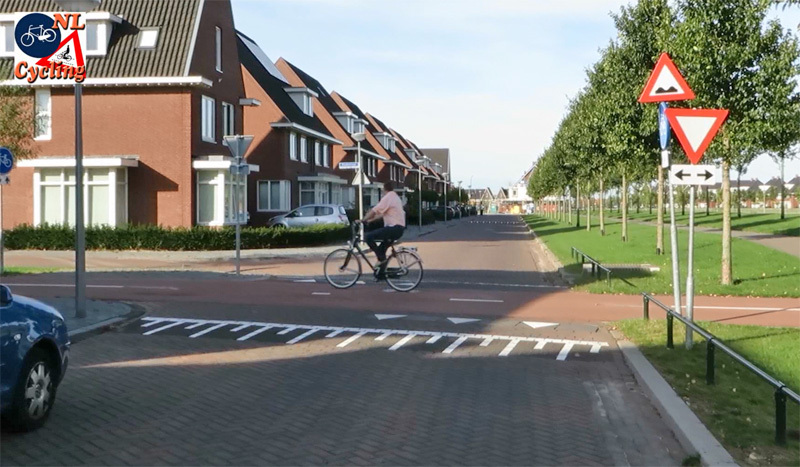 In February 2015 the municipality promised the residents to let Dutch Road Safety Institute SWOV investigate the crossing according to the DOCTOR method. People who experienced or witnessed an incident were asked to share their story for this investigation, in April 2015. Possible findings were not (yet) published, as far as I can tell. The latest incident I found reported at this location dates from June 2014. So it would seem there were no crashes after the July 2014 reconstruction. This was considered the most dangerous crossing in the entire suburb. The power sub-station (to the right) makes approaching people invisible according to the residents. The municipality claimed everything is within standards. The centre refuge islands were a later addition to make this crossing safer for cycling and clearer for motor traffic. Speed bumps were used to slow down motor traffic that allegedly drives much faster than the 30km/h which is allowed at this point. From about every location in Groote Wielen you can cycle to the centre of the former village of Rosmalen in about 10 minutes (on very good cycle routes). 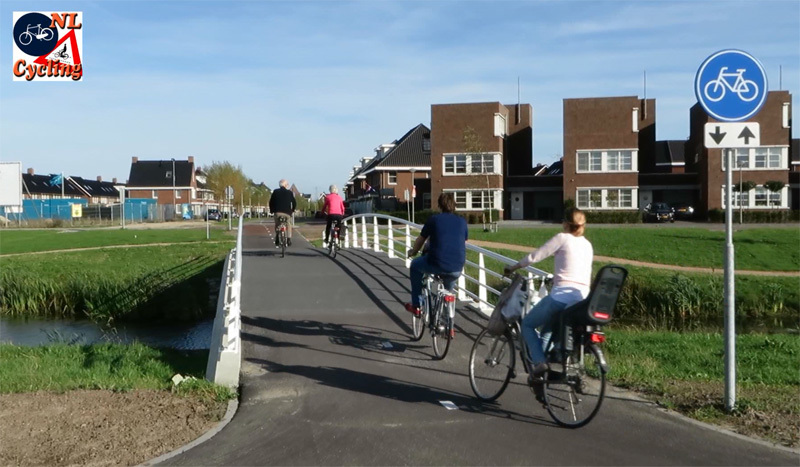 Cycling the circa 8 kilometres to the centre of ʼs-Hertogenbosch can be done in about 30 minutes, at – what the Dutch consider – a common average cycle speed of about 16 km/h (10mph). 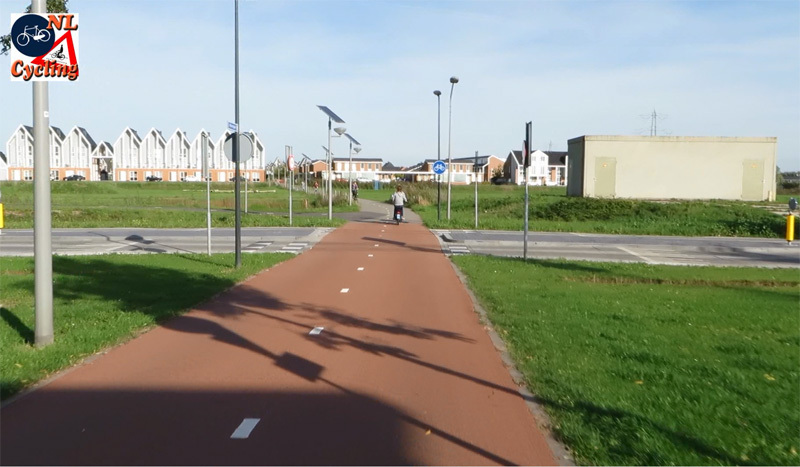 This is a main cycle route (the one that is shown in the video below). Kept as far away as possible from motor traffic on an entirely different route. The new suburb will get a lot of amenities. A business park is under construction, but only ‘clean’ businesses will be accepted, no industry. So there is room for big box shops, show rooms, wholesale traders and business services. In future there will also be room for offices. There is a temporary shopping area, built to function a few years, where you can get your daily groceries and other first needs such as toiletries. A permanent shopping area is planned in the future ‘centre’. This will house a range of shops that will sell anything you could need for daily life. There are lots of play areas for children. There are two types for different age groups. For the up to 6 year olds there is a high number of smaller play areas. In Hoven they are no further than 100 metres from every home. The 6-12 year olds have fewer play locations, in Hoven there are 2, but still they are no further than 400 metres from any residence. This means children can go there on their own, also because they’re kept away from motor traffic routes. Only of many play areas for smaller children (up to 6 years of age, but also older children use them). The homes look onto the play area so children can use them ‘unsupervised’. A fence between the grass and the cycle route is not necessary. The speed of cycling makes that you can almost always react in time when a child would run onto the cycle route. Dutch children also learn where they can and cannot walk at a very young age, so the risk is low. Children can also go to day care and school in their own neighbourhood. Five primary schools are planned and most were already built and functioning. In the long-term (when the children reach the age for secondary schools) a secondary school may be built, depending on the demand. Until then, children from the age of 12 will have to cycle to either ʼs-Hertogenbosch or Rosmalen (which is very common in The Netherlands.) There are several medical centres in which you can find family doctors, dentists, obstetricians, a pharmacy, and so on. Dwellings for seniors were already built and in the long-term there will be a care home as well. Groote Wielen also has a Green Zone, where the sports facilities are grouped together. There are fields and clubs for football (soccer), baseball, korfball and pétanque. There is also a horse riding school and the tennis courts that were originally in a different location will also be relocated to the Green Zone. An example of a crossing of the cycle route and a residential street that can also be used by motor traffic. The crossing is raised and people cycling have priority. The lines indicate that raised crossing. The shark’s teeth on the road and the signs tell traffic arriving here that it has to yield to cycle traffic coming from both sides. From all these amenities it becomes clear that this suburb was designed to function as if it is a separate and independent town. A lot of people will not have to leave the area often. Especially children and the elderly will find everything they need only a short distance away. This makes cycling a perfect and viable transport option. That cannot only be achieved by how you design an individual street or cycle route; the whole concept of the suburb has to accommodate cycling. The design of this development Groote Wielen does just that. My video for this week shows some background info and a main cycle route from beginning to end. The full route as shown in the video from west to east, through three neighbourhoods. Left to right: Hoven, Broekland and De Watertuinen. (Courtyards, Brookland and The Water gardens). The main cycle route ends here in “Watertuinen” (Water gardens), an area where the homes are completely surrounded by water. Really, thanks for giving this kind of information on the professional done article. Amazing. Demoralizing when compared to Australian suburbs. Designed for speeding cars and not a child in sight. Very informative and interesting description. How well does the town design work for pedestrians? Do they have to use the bike paths to get to some destinations? If a pedestrian wants to cross the bike path I assume they give way to bikes; is this also the practice where a footpath crosses a bike path? It also looked like some of the scooters were exceeding the 25km/h limit. Will there be more trees, shrubs and flowers planted beside the bike path ? I realise you can’t describe everything but these are the questions your blog raise for me. Yes pedestrians give way to cyclists. It is like crossing the road and waiting for motor traffic, if you cross the cycleway you wait for cyclists. Pedestrians do have their own space where a many pedestrians are expected to walk. Where that is not the case pedestrians are allowed to use the cycleway. Scooters do speed in very high numbers. That is why most people want them off the cycleways. But that is still not taken care of. Bollards are a problem. We want them as little as possible but you cannot take them all away. Do you know if or what provisions for public transit are there. It seems like the community is relatively spread out and would be difficult to serve efficiently with public transit. There are two buslines. One to ‘s-Hertogenbosch and one to Rosmalen and then to ‘s-Hertogenbosch. And there is an extra bus line in rush hour that stops less and goes directly to ‘s-Hertogenbosch central station. Those are last year’s route, I think. 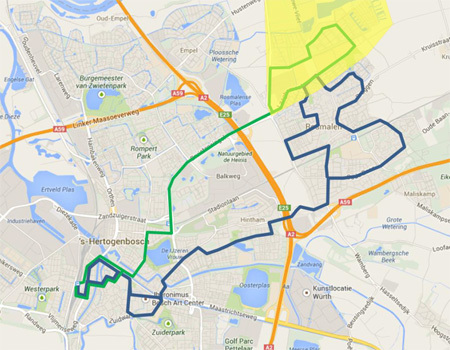 The current situation can be found at http://www.arriva.nl/uploads/media/_s-Hertogenbosch_01.pdf De Groote Wielen is to the far upper right; it is served by line 13 (dark blue), which however is changed to line 3 (green) in Rosmalen. (further explanation: grey are regional bus services, orange are bundles of 4 or more buslines). The route parallel to the north of the shown cycle route has a separate bus lane. There is a single bus service serving De Groote Wielen at the moment, running twice per hour Den Bosch Station-Groote Wielen-Rosmalen center and vice versa. I see that stretches of cycle path have solar panels alongside them. For one or different purposes, do you know? PS: a very informative, elaborate post, Mark, kudos. Did you touch on it (re: to Houten) because of the extensive discussion on Twitter last week? This was in the pipe line for a very long time (filmed last October!) so not really. And I don’t really know what discussion you refer to. Well they are attached to the lamp posts so I assumed they were for those lights. That is part of a very good way (environmentally) of collecting clean rain water in this neighborhood to make sure it doesn’t end up in the sewers. I couldn’t even mention that, the story was already so long! 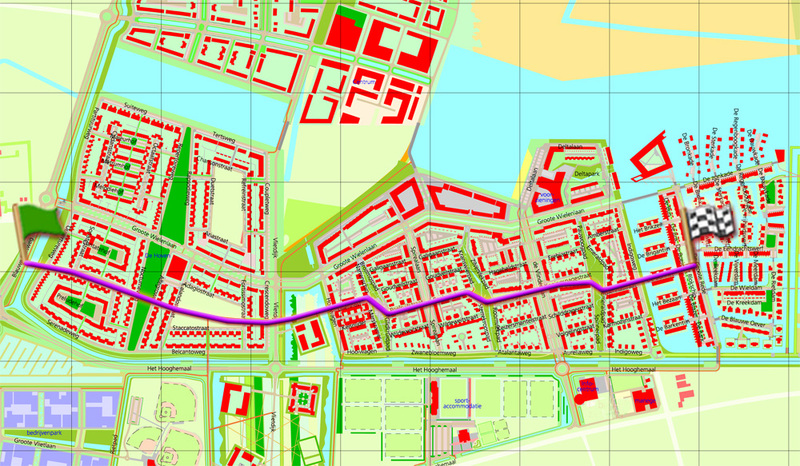 This entry was posted on 23 June 2015 by Bicycle Dutch in Original posts and tagged ’s-Hertogenbosch (Den Bosch), main cycle routes, ride, Rosmalen, unbundling, urban planning.